Junior forward Miracle Walters drives down the lane for two of her game-high 10 points. 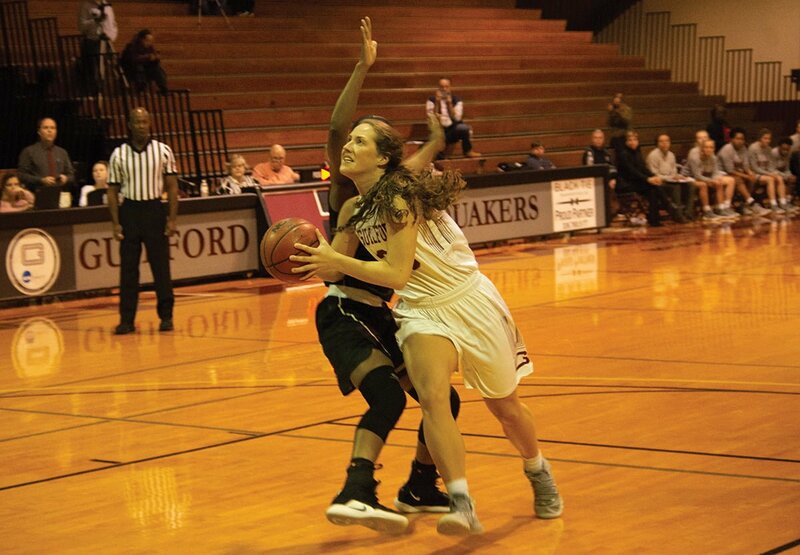 The Guilford College women’s basketball team beat Ferrum College 46-27 Wednesday. The Quakers started off the game by going ahead 15-2 after one quarter. Ferrum made one-of 10 shots in the first quarter and Guilford was six-of-12. A low scoring second quarter where the teams scored a combined 12 points led to a 20-9 Quaker lead at half. First-year Calyn Davis made two three’s in the first half. The Quakers continued to extend the lead in the third quarter and coasted to the victory over the last-place team in the Old Dominion Athletic Conference. Miracle Walters led all scorers with only 10 points and added six rebounds. First-year wing Lindsay Gauldin put in eight points, seven rebounds and five steals. Off the bench, first-year guard Victoria Young scored five points and collected four rebounds in 22 minutes of play. Sophomore forward Monell Dunlap added five points and four rebounds as well in 20 minutes. The Quakers’ defense held Ferrum to 24.4 percent shooting on the game and the lowest points allowed in a game since a 65-25 victory over Shenandoah University on Feb.7, 2015. Ferrum’s top scorer on the season, senior guard Jasmine Barr, was held to two points and went one-for-12 from the field. Ferrum got 19 points from their bench. Guilford won six out of their seven contests in the month of January. The Quakers sit top in the ODAC and face Eastern Mennonite University Jan. 26. The Quakers next home game is on Feb. 2 when Washington and Lee University comes to town.